All of these maps are commissioned by a friend of mine (MitchellFarted). Keep in mind that I usually don't make Team Fortress 2 maps, and that these aren't the nicest ones around. My first attempt to a Team Fortress map. Based on a top-down map made by the friend that commissioned it. An entrance to a contest on gamebanana. Code name Dragonfruit. 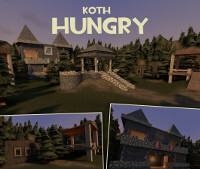 A medieval KOTH map. The better map of the three! Also based on a mock-up map by the friend that commisioned it.